The shares during these “off-season” sessions will primarily contain the hearty vegetables and fruit that these months offer us. The produce will either come from Jubilee Farm or will be purchased from other farms that are Certified Organic. We aim to source all of our produce from WA/OR farms but during the tightest months we do sometimes reach out to CA farms as well. These boxes will feature a variety of storage crops like; carrots, beets, potatoes, turnips, onions etc. as well as hearty greens such as kale or collards. We often include locally grown mushrooms, microgreens and our own eggs to provide some variety. As Spring approaches we begin to see more tender greens like arugula and cool weather crops like radishes and herbs. Cooking with local produce in the colder months of the year here in the Pacific Northwest is an immensely rewarding challenge, and to help you work with the delicious produce you receive each week in every box, you’ll receive our specially curated boxletter with recipes and helpful tips for working with your weekly box. The Three Quarter Share is designed to meet the basic needs of 2 adults or a family with one or two small children; it contains about 25% less produce than a Full Share. The cost of delivery is included in this price. The Full Share is designed to meet the basic needs of a family of four or those folks who like to eat vegetables. The cost of delivery is included in this price. Our off-season sessions are delivery-only: boxes of produce are available at depots throughout Seattle and the Eastside on Wednesdays from noon – 7 pm. This sounds wonderful. I wish there were deliveries to spokane. Aw thanks! 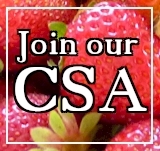 I bet there are some great CSA farms out in the Spokane area. We went today with our kids to get pumpkins! The atmosphere there was great and we all had a wonderful time. The boys of course loved the trebuchet! Thanks for a great day!